As for the 1553, that's an obvious 'typo' but indexing rules are that you record what is written. To me, it appears as if the "7" was added later by a clerk, trying to correct what otherwise would be an impossible age. But what if the year of birth as written originally by the enumerator was correct, and it was the age that was wrong? In that case, the clerk's "correction" would have made one wrong piece of data into two wrong pieces. 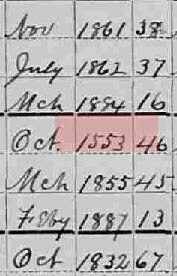 Thus, if I could accurately determine what it was that the enumerator originally wrote, I would key that year, not the "7". If I could not figure out what it was the clerk originally wrote, then I would probably key a "?" to indicate an illegible character. Of course, doing so would likely be tilting at a windmill, since I would probably be keying something different from the other keyer, and the arbitrator would presumably side with what the other keyer used, since FamilySearchIndexing provides no way for a keyer to note to the arbitrator why it was he or she keyed something the way he or she did. Many fields may contain corrected or crossed-out information. * When information is crossed out and then replaced, type the new data into the appropriate fields. Excellent comments. Hmmmm. Maybe I've changed what I'll give as the answer. But maybe I won't... Any other viewpoints out there?